1. 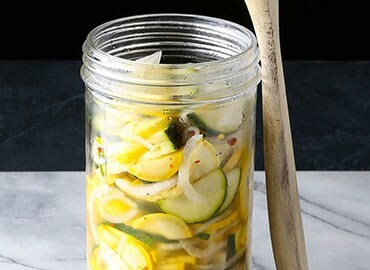 Place zucchini, squash, and onion in a medium glass bowl. 2. Combine remaining 1 teaspoon salt, 1 cup water, and remaining ingredients in a small saucepan; bring to a boil, and pour over vegetables. Weigh down vegetables with a plate. Cover and refrigerate at least 2 hours or overnight. Drain or serve with a slotted spoon.